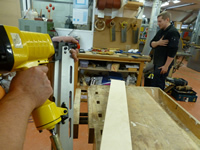 Nail guns are used in workshops during assembly, for example bed manufacture or pallet making. They also get used a lot on site for shop fitting, timber frame erection, etc. 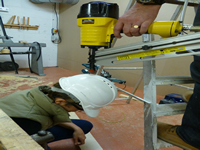 The use of nail guns has increased dramatically over the last few years and nail gun incidents now feature in high numbers in HSE’s woodworking accident statistics. 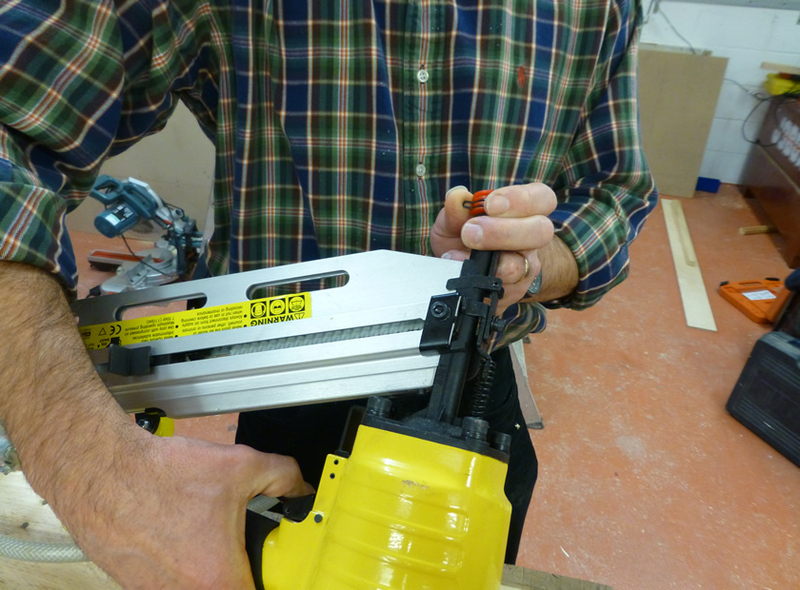 Nail guns use a piston that is driven at high speed onto the head of a nail (or large staple) to force the fixing into the timber in one adjustable strike. The nails range in size from about 15mm to 100mm long and these are held in strips in a magazine. There are three main types of nail gun. For factory use the type operated by compressed air is most common. For site use the type using butane gas is widely used. The butane is mixed with air in a combustion chamber and ignited by an electric spark when the trigger is pulled. The third type are light weight and much less powerful and use an electric motor and spring to drive the piston - some of these are battery operated. This web page does not cover the use of much more powerful cartridge nail guns that are used for fixing materials into steel or concrete. 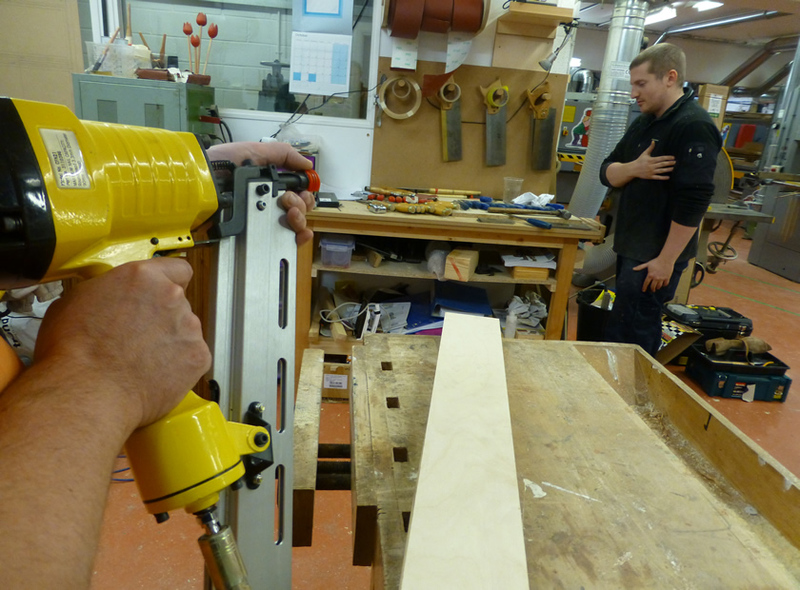 Nail guns for timber have built in safety features and before the gun can be fired by pulling the trigger the nose guard must be retracted a sufficient distance to activate the firing mechanism. This is designed to occur when the gun is pressed against the timber. However analysis of nail gun incidents investigated by HSE has found that these safety features can be defeated, either accidentally or sometimes intentionally. All incidents investigated were found to come within the following five categories and all of these possible scenarios should be considered when controlling the risks from nail guns. The following reconstruction photos were taken using a disconnected pneumatic nail gun. Operator’s position and gun angle – placing themselves in line of fire and shooting own torso. Operator accidently shooting themselves during nail gun maintenance without disconnecting airline (or removing battery, gas canister) and nails first. Operator carrying the gun with a finger on the trigger, then making accidental contact with someone's head, or own leg etc. Operators hand positioned too close to workpiece and shooting own hand, sometimes through the workpiece. Deliberate act of stupidity by the operator, shooting another worker. 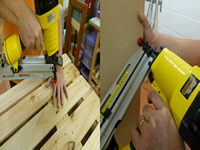 Repeat firing features are not suitable on nail guns that fire large nails for construction use - ie a second nail should not be fired unless the trigger has been fully released and then pulled again. Repeat cycling with the trigger depressed may be suitable for installing multiple short nails or small staples through thin sheet materials or for upholstery fixing. Nail guns should not be modified - other than fitting manufacturer approved parts or accessories. Safety features must not be defeated or disconnected. 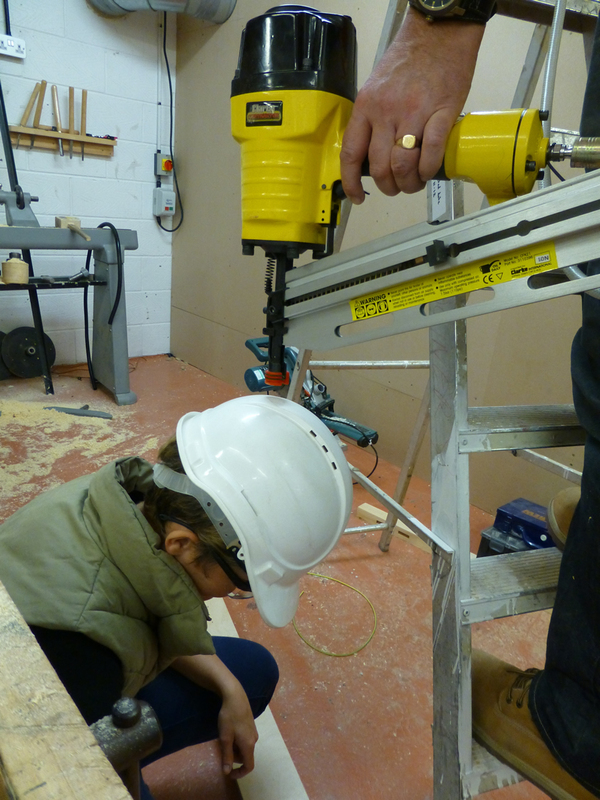 When using a nail gun there is always the risk that a nail may be deflected or that splinters could be ejected towards the operator or those nearby or that exhaust gas could propel dust into the operator’s face. Eye protection should be used to reduce the risk of these injuries. Accident analysis found that the vast majority of eye injuries caused by nail guns would have been prevented if eye protection had been worn. Nail guns can also produce high noise levels, particularly when used in a machine configuration, for example when making fence panels. However, you can significantly reduce noise levels if you build an enclosure around the machine. A company who built a partial enclosure over the nails guns on a panel making machine using wood and loft insulation managed to reduce noise levels by 6dB. 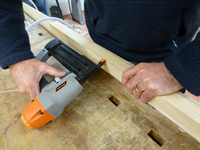 On some mobile pneumatic nail guns noise can be reduced by upgrading the air exhaust muffle or silencer to more smoothly dissipate the used air. Workers need to be trained prior to operating nail guns. They need to understand how the tool should be used and how things can go wrong - including the incident causes listed above. The level of supervision provided should be proportionate to the age, experience, ability and attitude of each worker. Any incidents or near misses should be investigated by management to find out why and how the incident occurred. Action should then be taken to prevent it being repeated.